MOST OF US recognize Aristotle as the founding father of logic. But not many seem to know that he is also the founder of the ”logic of preference”. Konrad Marc-Wogau and Nicholas Rescher are, at least to my knowledge, the first to have pointed this out.1 It is in Book III of the Topics that Aristotle lays the foundation of modern preference logic. The basic idea is the concept of ai’retw´teron (the worthier of choice), i.e. the concept of preferability. The German translation of this concept is ”wünschenswerter,” i.e. a slight change of connotation.2 The English translation ”desirable” is not very good.3 First, it is not the best translation of the Greek word; second, it conflicts with Aristotle’s text, with his intentions and his philosophy. It changes the connotation too much; something can, for example, be desirable without being worthy of choice; it simply is not an option. Aristotle is very clear about this. The preference relation that Aristotle has in mind, I take it, is defined over what would be called, in the jargon of modern decision theory, acts or options, i.e. over what is eligible for choice. Thus it is not primarily the ordering of the consequences of our acts that Aristotle is concerned with, but the ordering of acts or the options themselves. For the modern reader Aristotle’s text is opaque. Throughout Topics he seems to mix the discussion of material and formal principles. He says, for example, that ”to be a philosopher is better than to make money” (118a10-11), a perfectly sound material principle. But there are also formal principles of the type: ”Also A is preferable to B, if A is an object of choice without B, while B is not an object of choice without A;…” (118a20-22), which, on the other hand, is an example of a formal principle that has played a central role in the development of preference logic. But, if Aristotle’s syllogisms are deductions rather than propositions, then his generic preference principles are but deduction patterns. The formalized syllogisms we find in Aristotle can therefore be read as generalized material inferences. This makes it difficult to compare what Aristotle has to say with more recent works on the logic of preference. A distinction that Aristotle makes is that between ”more worthy of choice” and ”better”, between ”ai’retw´teron” and ”be´ltion”. In other words he seems to have not one but two concepts of preferability – one situation specific and one absolute. He says, for example, ”[s]ometimes better things are not also preferable; for it does not follow that, if they are better, they are also preferable” (118a8-10). To embody this he tells us that it is obviously better to be a philosopher than to make money, but that this is not preferable for him ”who lacks the necessities of life”. To be a philosopher is better for man because that would mean ”the actuality of a soul with respect to its function” (1098a16); it would mean the consummation of his functions. If being a philosopher is not eligible for choice, it may well be preferable to making money. This distinction is, no doubt, important if one wants to understand Aristotle’s view on these matters. In what follows I will point out some formal preference principles that can be found in the Topics and briefly outline the role these principles play in today’s theories of preference, utility, and decision. In On the Logic of ’Better’ Sören Halldén defends a principle that says that the better the presence of something is, the worse is its absence.5 If coffee is better than tea, then not-tea is better than not-coffee. Or, to take a more extreme example, if not-cancer is better than not-flu, then flu is better than cancer – which on the surface sounds quite reasonable. What he seems to have in mind is the following version of the conjunction principle: A and not-B is preferable to B and not-A, if A is preferable to B.7We note that this implication entails a principle that is almost its converse, the only obstacle being cases of preferential equality. But if we make the fairly reasonable assumption that the ”if” in Aristotle’s text is to be read ”if and only if,” as is often the case in ordinary language, there are, of course, no problems whatsoever in deriving the contraposition principle. then A is preferable to B. A few lines later he says that: ”Furthermore, that is preferable at the absence of which it is less reprehensible to be annoyed; …” (118a24-25). This is, I think, a more direct statement of the contraposition principle. You prefer being a philosopher to making money. Thus, not to make money is better than not to be a philosopher. You would be far more annoyed not being a philosopher than you would be not making money. Your preference ranking is, from our or from the Aristotelian point of view, perfectly sound since it isbetter (in an absolute sense) to be a philosopher than to make money. That you are far more vexed over not being a philosopher than you are over not making money is entirely understandable and not the least reprehensible. Marc-Wogau’s counter-example: Let ’A’ be the proposition that X gives 100 dollars to charity and ’B’ the proposition that X gives 50 dollars to charity. A is preferable to B; it is better that X gives 100 dollars to charity than 50 dollars. But, is not-B preferable to not-A? Is not giving 50 dollars to charity better than not giving 100 dollars to charity? Hansson’s counter-example:Let us imagine a lottery consisting of 1000 lottery tickets, with the following prizes: Ticket #1 gives 100 dollars in cash, tickets #2-#100 give 99 dollars each, and tickets #101-#1000 give 0 dollars each. Let ’A’, ’B’ and ’C’ stand for the propositions: the ticket gives 100 dollars; the ticket gives 99 dollars; and the ticket gives nothing, respectively. Needless to say A is preferable to B. It is better to get 100 dollars than 99 dollars. But, again one might ask, is not-B preferable to not-A? The probability distribution over prizes makes the disjunction not-A, either 99 dollars or nothing (B or C), preferable to the disjunction not-B, either 100 dollars or nothing (A or C). There is but one chance out of a thousand to get 100 dollars, but 99 chances to get almost as much money. Thus, these and other counter-examples show that the validity of the contraposition principle can be put in question.10Consequently it is not one of the most honoured axioms of preference logic. However, making a clear distinction between options and outcomes, options being functions from states to outcomes, the principle might well be defended, i.e. if we are, as Aristotle probably is, talking about acts or options. I believe that Halldén is right when he argues that the principle can be defended in a ”probability-free world”. Marc-Wogau’s counterexample, for example, does not have the same force, if it has any, as Hansson’s example. One of the most celebrated principles of decision theory is L. J. Savage’s so-called sure-thing principle.11 This axiom asserts that if two alternatives have a common outcome under a particular state of nature, then the ordering of the alternatives should be independent of that outcome. Savage’s own formulation of the principle is in terms of acts, states and outcomes. In this context, however, we should look for a more simple formulation, one within the framework of preference logic. This principle is equivalent to the conjunction principle mentioned above and advocated by both Halldén and von Wright,13 namely, that comparing A and B means that one is comparing A without B on one hand with B without A on the other hand. That is: A is preferable to B if and only if A and not-B is preferable to B and not-A. From this principle the contraposition principle is swiftly deduced. In a discourse on the operator ”is at least as probable as”, Peter Gärdenfors explores some basic theorems of qualitative probability.14 Translated into preference logic the results of his paper are intimately connected to those above. One of the axioms he introduces says that if A and C is preferable to B and C, then not-B and C is preferable to not-A and C; a principle stronger than the contraposition principle. This stronger version of the contraposition principle is definitely Aristotelian in spirit since, as Aristotle does in theTopics, it emphasizes the context (C). Furthermore, the axiom allows us to prove two theorems. First, the stronger contraposition principle is equivalent to a stronger version of the conjunction principle, namely that A and C is preferable to B and C, if and only if, A and not-B and C is preferable to B and not-A and C. Second, it is equivalent to a disjunction principle, a counterpart of Bruno de Finetti’s additivity axiom.15 But what Gärdenfors in the language of qualitative probability calls de Finetti’s additivity axiom is nothing but the above stripped version of Savage’s sure-thing principle. Both Aristotle and Moore can be said to have seen that some type of context involves rather sophisticated problems of (conjoint) measurement. Given the value of the ”organic whole,” is it possible to refer this value back to something more fundamental? Is there a way of separating the ”organic whole” into independent factors? Let me give an analogy: attributing beliefs and desires to human beings seems rather unproblematic. Intuitively we all act as if we have a set of values and various beliefs and degrees of beliefs. But, assume that our beliefs and desires are simply epiphenomena of something else, of a whole, i.e. of our expectations. It is our value-impregnated expectations that are the basis for action. Few of us, I think, have ever made an everyday decision based on the aggregation of beliefs and values. Instead our expectations have guided us. Some sort of measuring procedure can, of course, be used to separate expectations, to separate beliefs and desires, cognition and non-cognition (motivation, emotion, etc.). But a method of this kind, depending on the robustness of our expectations, will only give a more or less rough idea (measurement) of our beliefs and values. What has happened in psychology is that it has been argued that our expectations have to be referred back to something considered to be more fundamental, in this case often our beliefs and values. However, from a psychological point of view it is not obvious that we gain anything by doing so. One problem, for example, is that it could be argued that our beliefs and values should comply to a rule of monotonicity. However, this is far from obvious if we look at our expectations. If we have enough bricks and mortar we can build a house. The value of the whole house is greater than the value of its parts. What has happened is that the bricks and the mortar are arranged in a definite way so that a new set of relations obtain. However, given the house I am far from sure that it makes sense to say that its parts are the mortar and the bricks. This is very much the problem of psychology. But let us return to Aristotle. What he seems to have realized is that if the substitutivity condition, or an appropriate condition of independence, is not satisfied, then it might turn out that his preference principles do not give the right recommendations. More condensed: assume that A is preferable to B, D is preferable to C; then, if AC is preferable to BD, A is preferable to D.
What does it mean to say that A (D) and B (C) are opposites? That B is not-A? But then the syllogism collapses into the contra position principle; and this, I think, is not what Aristotle has in mind. By ’opposite’ he most likely mean something like ’having opposite utility values’; the utility of A is the same as the disutility of B. He is thus assuming more than an ordinal ordering of the prospects. If A and B are opposite in the sense that the utility of one of them equals the disutility of the other we can analyze Aristotle’s reasoning as follows. Being opposite in this sense implies that a fifty-fifty lottery between A and B has the same utility as status quo; and similarly for D and C. Assuming additivity, the utility of AC equals the utility of A plus the utility of C; and similarly for BD. Thus, from the assumptions that: (i) a fifty-fifty lottery between A and B has the same utility as a fifty-fifty lottery between D and C; (ii) the value of A plus B is greater than the value of B plus D; it follows that the utility of A is greater than the utility of D.
There are, of course, other ways in which Aristotle’s syllogism can be analyzed, and with far less heavy artillery. But this is one way to transform his thoughts into the language of modern decision theory. Finally, the substitutivity condition tells us to be wary. Assume for example that the utility of the complex ’AC’ is not expressible as the sum of the utilities of its individual components, then Aristotle’s reductio argument is problematic. A man has a choice of two boxes of assorted chocolates; ”which one shall I choose?” he asks himself. Both boxes contain the same number of chocolates. One of them contains a piece of chocolate cream that he is particularly fond of, but also several others that he truly dislikes. The other box contains the type of chocolate you find in most boxes of assorted chocolates, nothing really sensational, but nothing really insipid. Which of the two boxes is the better, which one should he choose? This is a classical problem and it comes in many guises. It is at the heart of, for example, preference logic and decision theory, but it can be found in other contexts as well. A well-known answer to the problem is that the rational thing to do is to choose the act that maximizes the minimum payoff, i.e. here, to choose the box with the best worse chocolate. A chief criticism of this rule is that it is too conservative and pessimistic-it focuses too strongly on the worst outcomes. In fact if we have a choice between status quo and an action that gives us either a gain or a loss, it always tells us not to gamble, even if the possible gain is enormous and the possible loss infinitesimal. A is better than B if and only if amax is better than bmax, where amax is better than ai, bmax is better than bi for all ai, bi in A and B, respectively. It takes no effort finding counterexamples to this principle. It is highly questionable, for example, if the best philosophy department is the one with the single best philosopher. On the other hand artists are often judged by their best painting. It seems obvious enough that it is The Bride Stripped Bare by Her Bachelors, Even, i.e. the Large Glass, this enigma of 20th century art, that Marcel Duchamp will be remembered for. Similarly, if Robert Rauschenberg survives the oblivion of history, it will be for his best known ”combine”, the Monogram (1955-59, the stuffed and painted Angora goat, which is standing on a painted platform with an old rubber tire around its abdomen). But can we say, for example, that Duchamp is the greater artist merely because the Large Glass is better thanMonogram? However, this is probably not the way to interpret Aristotle. Above, it was emphasized that he is primarily concerned with options or acts, not with outcomes. Thus, a far more sympathetic reading of his maximax criterion runs as follows. Assume that a man is considering two decision problems. The first has a set of possible options A; say a1, a2, …, an, and the second a set of options B; b1, b2, …, bn. Now, if amax and bmax are the two best options, and if amax is better than bmax, then we can say that A is better than B. This is perfectly consistent with the standard theory for rational decision-making. Furthermore, as Aristotle might well be pointing out, if we do not satisfy the substitutivity condition, if combining the sets A and B changes our preference ordering between amax and bmax, this can get us into serious difficulties-a fact well-known to modern decision theory. Why is Aristotle’s text opaque? Maybe because we look for the wrong thing. InTopics we find the seeds of a logic of preference, and still Aristotle seems not to be in search of a complete logic of preference. A possible interpretation is that Aristotle, contrary to his modern followers (e.g. Halldén), was not very interested in what it means to say that A is preferable to B. What he is doing and what he wants to do is to give a description of the world around him, to point to some common features. One reading of Aristotle is that he is far more the empiricist than the theoretician. What he is doing in Book III of Topics is to collect and systematize empirical evidence. Aristotle’s formalized syllogisms are but generalized material inferences. Most people, for example, have to make money rather than spend time on philosophy. Look around, and you will see that what Aristotle says is true. Reading Aristotle in this way has several advantages. We come to understand the difference between ”worthy of choice” and ”better”, the difference between the two concepts of preferability. The former is situation specific and can be read as a descriptive notion. The second, however, is absolute and is not easily compared with a traditional normative (or descriptive) notion. It tells us more than that it is rational to obey the principles of preference logic, the values are determined from the start. The former is either a description of the preferences people in fact have or the result of inductive systematization. And, of course, they do not always coincide, like money and philosophy. A sound decision maker, a ”rational” man, is one who conforms to the Bayesian maxims. Similarly, a man lives a ”good” life if he performs the proper functions of a man. To live a good life one thus has to make sure that what is considered worthy of choice is what is in fact the better. Making money does not lead to a good life. It now also becomes obvious why Aristotle emphasizes, at the beginning of Book III, that he is ”concerned with things that are closely related and about which we discuss which we ought preferably to support…” (116a8-9). Finally, in view of Aristotle’s general work this interpretation seems not too exorbitant. He was the solid scientist with a profound interest in empirical facts. Jerker Blomqvist, Peter Gärdenfors, Sören Halldén, Bengt Hansson, Simo Knuuttila, Isaac Levi, Hans Regnéll, Fredrik Stjernberg and Georg Henrik von Wright have helped me clarify my thinking and given me numerous valuable suggestions. This paper draws on an unpublished Swedish manuscript, Aristoteles och beslutsteorin, which I wrote in 1981. However, it is not a translation of that paper, although the ideas are very much the same. 1 In Sakkunnigutlåtande rörande sökande till professuren i filosofi vid Göteborgs Högskola, (a report on an early version of what later became Sören Halldén’s On the logic of ’better’) 1950, p. 50, and ”Semantic foundations for the logic of preference” in The Logic of Decision and Action, N. Rescher, ed., Pittsburgh: University of Pittsburgh Press, 1966, pp. 37-79, respectively. Several interesting examples can be found in R. C. Jeffrey’s The Logic of Decision, 2:nd edition, Chicago: University of Chicago Press, 1983. 2 See Aristoteles Philosophische Werke, Leipzig: Verlag von Felix Meiner, 1920. 3 This is the translation of The Complete Works of Aristotle: The revised Oxford translation, Barnes, J., ed., Princeton: Princeton University Press, 1985. The French translation ”préférable”, is better than ”desirable” (see Aristote: Topiques, edited and translated by J. Brunschwig, Société d’édition ”Les Belles Lettres”, Paris 1967). Something may well be preferable without being desirable. 4 See Savage, L. J., The Foundations of Statistics, London: Dover, 1972 (1st edition, New York:Wiley, 1954). My reading of Aristotle is strengthened by what he says in the Nicomachean Ethics. 5 Lund: CWK Gleerup, 1957. 6 London: The Loeb Classical Library, 1976. 7 The German translation of the central passage is: ”Und, wenn zwar das eine ohne das andere wünschenswert ist, aber nicht dieses ohne jenes,” which in the Loeb translation reads: ”Also A is preferable to B, if A is an object of choice without B, while B is not an object of choice without A; …”. If we compare with the original, ”ka`i ei’to´de me`n a’´neu touˆde ai’reto´n, to´de de`a’´neu touˆde mh´, …,” it looks as if the German translation is closer to the original, nothing is ”added”. However, ”wünschenswert” means ”desirable” rather than ”worthy of choice”-an option may be desirable although it is not worthy of choice. 8 This syllogism is discussed by R. C. Jeffrey in his The Logic of Decision, 2:nd ed., Chicago: University of Chicago Press, 1983. However, his counterexample violates an independence assumed by Aristotle. 9 See Marc-Wogau’s referee report and Halldén’s On the Logic of ’Better’, p. 29. Hansson’s example can be found in a letter to Halldén, written in the late 1960s; it is discussed in Halldén’s unpublished ’Decision principles in a probability-free world’, Lund, 1969. See also his ”The better something is, the worse its absence”, in Logik rätt och moral, Lund, 1969, pp. 71-81. 10 See Hansson, B., ”Fundamental axioms for preference relations”, Synthese, 18, 1968, pp. 423-442, and ”von Wright on the logic of preference”, The Philosophy of Georg Henrik von Wright, Schilpp, P. A. and Hahn, L. E., eds., Open Court: La Salle 1989, pp. 698-706, for a detailed and illuminating criticism of the principle. See also Hansson, S.-O., ”A new semantical approach to the logic of preference”, Erkenntnis, 31, 1989, pp. 1-42. 11 Axiom P2 of Savage, L. J., The Foundations of Statistics. 12 This disjunction principle is discussed in Halldén, S., The Foundations of Decision Logic, Lund: CWK Gleerup, 1980, pp. 43-45. See also Halldén’s discussion of the sure-thing principle, pp. 58-59, especially Theorem 16.3. 13 See Halldén, S., op. cit., and von Wright, G. H., The Logic of Preference, Edinburgh, 1963. See also Hansson, B., op. cit., for a discussion. 14 ”Some basic theorems of qualitative probability”, Studia Logica, 34, 1975, pp. 257-264. 15 See de Finetti, B., ”La prévision: ses lois logiques, ses sources subjectives”,Annales de l’Institut Henri Poincaré, 7, 1937, pp. 1-68. 16 This condition is discussed in Hansson, B., ”Risk aversion as a problem of conjoint measurement”, Decision, Probability, and Utility, Gärdenfors, P. and Sahlin, N.-E., eds., Cambridge: Cambridge University Press, 1988. 17 See Fumerton, R. A., Reason and Morality, Ithaca: Cornell University Press, 1990, and Sprigge, T. L. S., The Rational Foundations of Ethics, London: Routledge & Kegan Paul, 1988, for a more detailed discussion and references. 18 Indianapolis: Hackett Publishing Company, 1989, translated by R. Smith. 19 A difficulty is that Aristotle only is talking about ’better’, not about ’preferable’. 20 See Sahlin, N.-E., ”Baconian inductivism in research on human decision making”, Theory & Psychology, No. 4, 1, 1991, pp. 431-450. 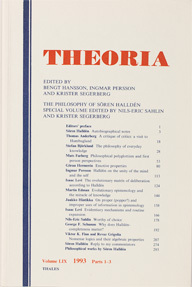 Published in Theoria, Volume LIX (1993), The Philosophy of Sören Halldén, special volume edited by K. Segerberg and N.-E. Sahlin, 178-91.